Categories 2 and 3 are both for horizontal blinds but didn’t fit my needs as my blinds look similar to these. There are two pull cords for the tilt adjustment: one moves the blinds one way and the other moves them the opposite. None of the solutions were suitable for my situation; on top of this they were unable to raise or lower the blinds. Even if they were suitable the price was pretty high: $75-250 depending on the solution! I chose a NodeMCU to do the prototyping with but will probably end up using a WeMos D1 mini as the final platform. The microswitches will be used to allow local control of the blinds in locations and functions similar to the original controls. I pulled a set of blinds down to see what I could do and found that the tilt was controlled by a little worm and wheel mechanism that turned a 1/4″ rod that ran the width of the blinds. This in turn pulled on one of two strings to control the angle of the ladder that the blind slats lie in. 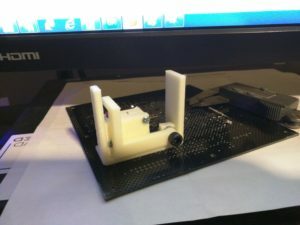 The body of the top of the blinds is made from bent sheet metal that is shaped into a U. I designed and 3d printed a bracket to hold the servo in the proper position as well as a servo horn adapter to attach to the rod that controls the tilt. In this picture you can also see an earlier iteration of the switch and actuator arm that will be used to control the tilt electronically. Here’s a different look at that mechanism. A string will go through the body and attach to the arm. Pulling the string will depress the roller lever on the switch and open a connection on the microcontroller. The easiest way to integrate DIY solutions into Home Assistant is via MQTT, a protocol for IoT(Internet of Things) devices. MQTT works as a pub/sub broker. The implementation I’m using is for my broker is Mosquitto running on a CentOS 7 platform. The NodeMCU platform has Wi-Fi hardware built in and is relatively easy to get sending/receiving messages via MQTT. I also needed a switch to enable local control of the hardware. I decided to use four different MQTT topics one each for tilt command, tilt status, raise/lower command, raise/lower status. As of now I’m still waiting on parts for the raise/lower and haven’t figured out how I’m going to handle status. The program expects to receive a value from 0-180 on the tilt command topic and will send this value to the servo to tilt the blinds to the appropriate position. 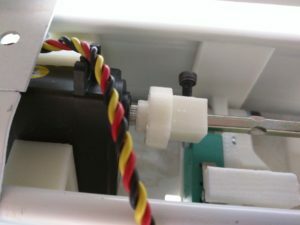 The method that actually controls moving the servo also handles updating the tilt status topic with the current position. This made adding the switch to control simple.